-- a Finalist at Seneca! Learn more on the SuperMOEva page. Learn all about MOErio on the MOErio page. LocoMOEtive was a Winner at Seneca, and Finalist at Westtown and Lehigh! Check it out on the LocoMOEtive page. 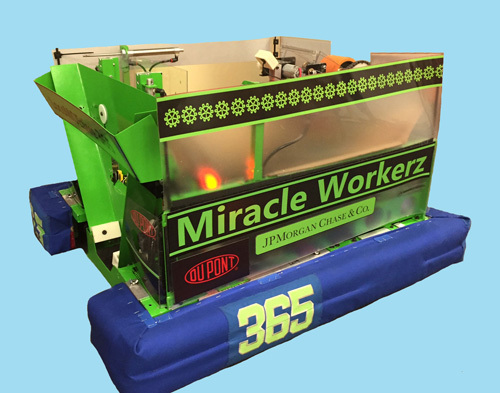 CaMOElot, our 2016 robot, was on the winning alliance in its first competition! Check it out on the CaMOElot page. See ToMOEhawk in action in videos on the ToMOEhawk page! 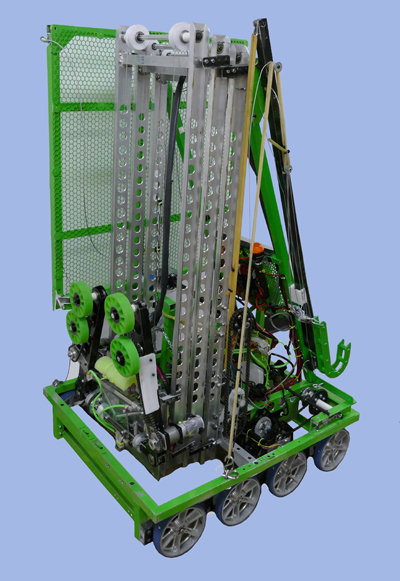 EliMOEnator is a bright green and black robot designed to collect balls quickly off the floor and thrown from Human Players. 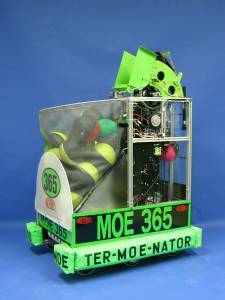 MOE has a 6-CIM, 8-wheel drive for speed and power, a catapult shooter, and many sensors for game-playing efficiency. EliMOEnator page! ArMOEgeddon is a speedy bot with a high mounted adjustable shooter for quick disk launching and the ability to pick up off the ground. 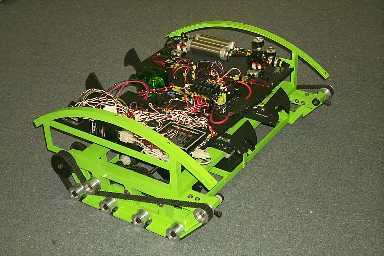 The bot features two cameras for shot alignment and floor pickup. 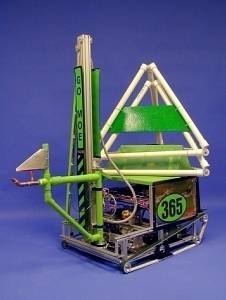 This tall bot stands 5 feet high and is able to get an easy 10 point climb in under 10 seconds. Check out more information on the ArMOEgeddon page! 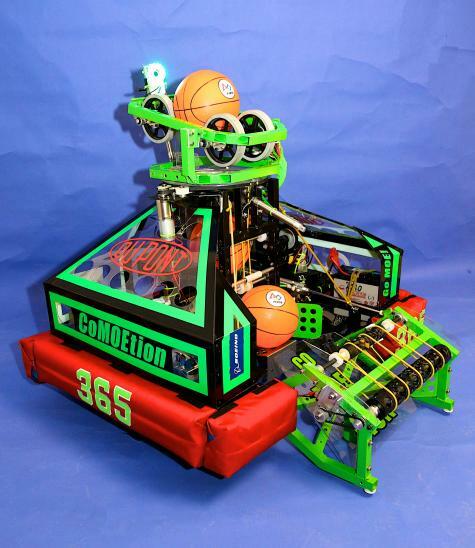 CoMOEtion is a wide-bot robot, with the ability to pick up the basketballs off of the field, and shoot them using a one-wheeled shooter. CoMOEtion is also known for it's ability to balance on bridges with both alliances on the designatied alliance or coopertition bridge. For more details about CoMOEtion, check out the CoMOEtion page! PandeMOEnium can navigate the field quickly and smoothly, picking up tubes from the floor or the feeder station in its roller grabber. It can hang tubes on any of the eighteen pegs, and in the endgame, our minibot will surprise you! More details to be revealed later on the PandeMOEnium page! 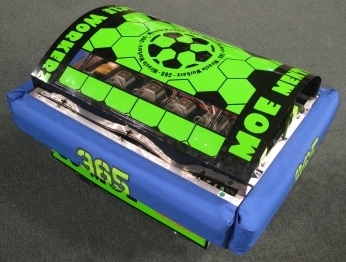 MOEmentum is a compact robot built to kick soccer balls into goals and drive comfortably throughout the course. 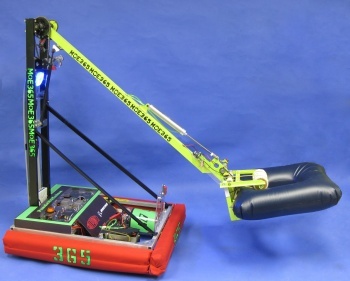 The robot is very complex and has many features that help improve its gameplay, such as many various sensors, a well-designed kicker, a camera, and a detailed program for autonomous and tele-op periods. See MOEmentum's page. 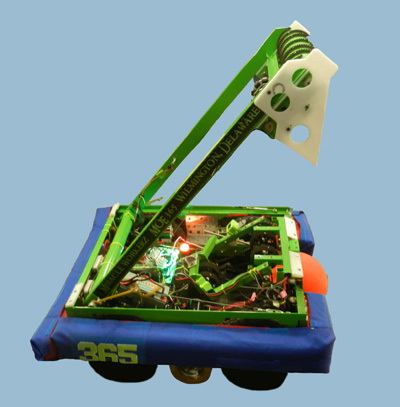 CozMOE is a bright green and black robot designed to collect moon rocks from the floor or Payload Specialist and dump them into trailers using a powered roller on a turret with motor-controlled vanes. 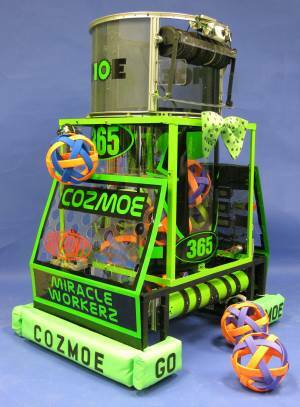 CozMOE also has a separate collection device for empty cells and multiple autonomous programs. See CozMOE's page. 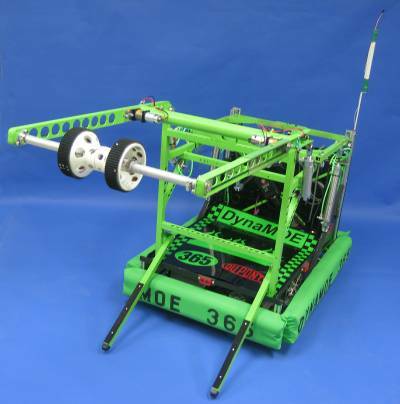 DynaMOE was designed to play first Overdrive. The field for this game represented a race track, consisting of four crossing lanes and two overpasses stretching across the center of the track, veritically, having two large trackballs on each overpass, randomly positioned. 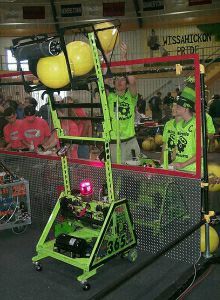 Points were attained by knocking balls off that are your alliance's during the hybrid period, and by the robot crossing lanes. Robots were also able to change lanes due to the ability of the RoboCoach, by controlling the robot with his or her remote. 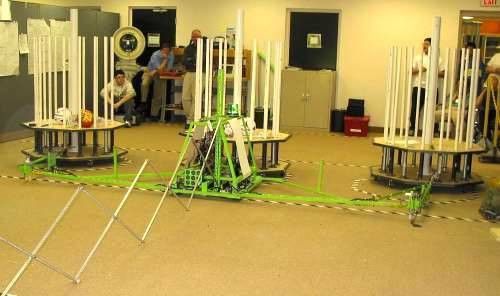 During the teleoperated period, robots could score by either hurdling a ball over the overpass, crossing its own finishing lane, or herding a ball over its own lane. Bonus points were also scored at the end of the match if one of the balls remained on the overpass when time ran out. With DynaMOE's design, it was able to successfully pick up balls, hurdle them, and place them onto the overpass. See DynaMOE's page. 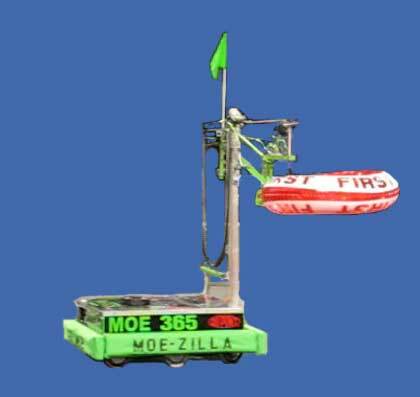 MOEzilla was designed to play Rack 'n Roll. In this game, points were scored by placing inflated tubular game pieces on to a giant structure in the middle of the field. MOEzilla accomplished this task lifting the tubes with a gripper attached to a telescoping arm. MOEzilla has been many places, including the White House to be driven by President George W. Bush! See MOEzilla's page. TerMOEnator was designed to play Aim High. In this game, points were scored by shooting balls through a vertically-oriented hole ten feet off of the floor, rolling balls through a small hole on the floor, and by climbing a ramp at the end of the match. 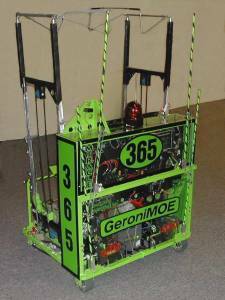 TerMOEnator accomplished the first of these tasks by picking balls up off of the floor or by receiving them from our human player, and then shot the balls through the hole with the assistance of a targeting camera. It could also climb the ramp very efficiently because of a wheelie-bar at the back that prevented it from tipping over. See TerMOEnator's page. MOEbius was designed to play Triple Play. In this game, points were scored by placing PVC tetrahedrons (such as the white ones pictured on MOEbius' back) on any of nine large tetrahedron-shaped goals on the field. MOEbius accomplished this by carrying multiple tetras on its back, and by lifting up to 3 tetras on to a goal at a time via its telescoping arm. See MOEbius' page. GizMOE was designed to play first Frenzy. The field for this game consisted of a large two-level platform structure in the middle of the field with a stationary goal on either end and a long horizontal pole ten feet off of the ground in the center. In this game, points were scored by throwing balls into either the stationary goals or the mobile goals, placing large balls on top of the goals, and by hanging from the bar at the middle of the platform. 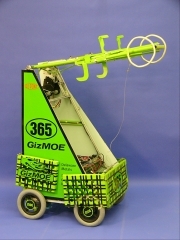 GizMOE was able to lift the large balls and cap the goals with its arm, and could use the hooks on the same arm to suspend itself from the bar above the platform. 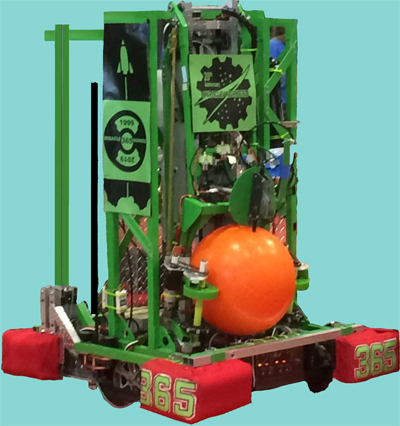 GizMOE's kilts, the green-and-black plaid painted plates at the front and back of the robot, were used to push the smaller balls into corrals for the human player as well as to prevent GizMOE from tipping over while climbing the platform. See GizMOE's page. GeroniMOE was designed to play Stack Attack. The field for this game consisted of a large ramp structure in the center of the field; the game pieces were 73-quart plastic storage containers. Points were scored by having a multitude of these containers in one's scoring zone, and a stack of these containers multiplied this score by the height of the stack. GeroniMOE could successfully collect and stack these containers to increase this score multiplier. See GeroniMOE's page. MOEhawk was designed to play Zone Zeal. In this game, points were scored by having any of the three large mobile goals in one's scoring zone, by having one's human player throw balls in to one or more of the goals in one's scoring zone, and by having any piece of one's robot in one's home zome at the end of the match. At the start of a match, MOEhawk would unfold a large wing on either side giving it a total wingspan of about 14 feet, and would then proceed to rush to the center of the field, grab all three goals, and push them in to it's scoring zone where it held them for the duration of the match. 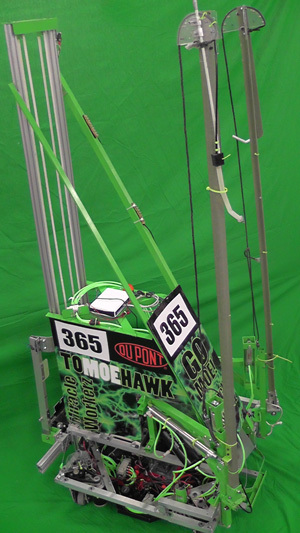 Near the end of the match, MOEhawk would deploy a 20-foot-long scissor-action device that extended all the way back to it's home zone to score even more points. See MOEhawk's page. Li'l MOE was designed to play Diabolical Dynamics. 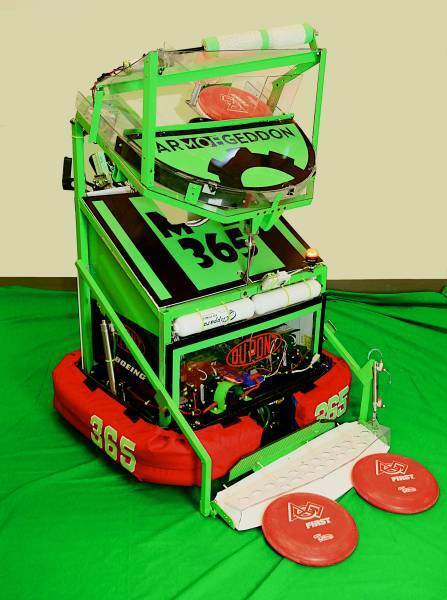 This was the last first game in which a match saw only one alliance on the field working together to achieve as high a score as possible rather than two alliances competing directly against one another. In this game, points were scored by filling two tall mobile goals with balls from one's human player, placing large colored balls on top of these mobile goals, having one's robot inside of their home zone at the end of the match, and by balancing one or both of the goals on a teeter-totter in the center of the field. Li'l MOE was designed to grab both mobile goals at the same time, one at the front and one at the back, and then balance them on the teeter-totter. To balance, Li'l MOE extended a short bar out of either side and then drove quickly up the teeter-totter. The bars would hit vertical bars attached to the teeter-totter, stopping Li'l MOE at the perfect position to balance quickly and efficiently.